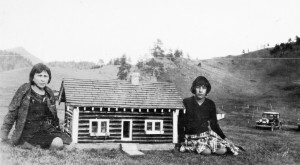 Dorothy and Gladys Hill, both Blackfeet tribal members and students at the Cut Bank Boarding School, showcased their project “Furnishing of a Model Indian Home” at the 1930 4-H Club Hi-Line Association Conference at Rocky Boy, Montana. Attendees included members of the Rocky Boy, Blackfeet, Flathead, Fort Peck and Fort Belknap reservations. The conference–which took place October 8-10–earned praise from officials who saw 4-H as a valuable tool of education and assimilation. Photo courtesy MHS PAc 84-59 f2. Montana’s 4-H clubs grew from three thousand youngsters in 1914 to over twenty thousand members a century later. The organization encourages children to develop skills that enable them to better their lives and strengthen their communities. Its emphasis on the economic importance of women’s work created leadership opportunities for women and inspired girls to partake in 4-H clubs, camps, and competitions. Women and girls in 4-H have proven their abilities while broadening the organization’s objectives and expanding its opportunities for boys and girls alike. When Montana’s Cooperative Extension Service hired Augusta Evans to organize the state’s first 4-H clubs in 1914, the nation’s agricultural industry was striving to stabilize food production. The Extension Service and experimental agricultural stations engaged 4-H youth in their efforts to apply an industrial approach to farming: maximizing efficiency using new technologies and boosting production by applying scientific methods. Initially, almost all Montana’s 4-H members were boys, and these early clubs produced corn, peas, potatoes, beef, and sheep. In contrast, the state’s first girls’ clubs focused on corset making. By 1930, however, the number of girls in Montana’s clubs exceeded the number of boys, and their activities had greatly diversified. Home Demonstration agents effected this change when they brought up-to-date techniques to rural women. Even women already experienced in canning and cooking benefited from the expertise of agents like Helen Mayfield, who demonstrated food preservation for maximum nutritional content. A 4-H leader from Rosebud County noted in the 1930s that farm women were often more bashful than their daughters but just as eager to try the newest technologies. This outreach to rural women stimulated a rapid rise of 4-H club leaders. Girls in sewing and dressmaking clubs gained proficiency in an economically valuable trade while introducing their mothers to the latest styles, tools, and fabrics. 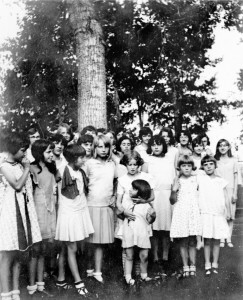 Through 4-H, rural girls also developed the confidence and etiquette equal to that of their urban counterparts. The prevalence of home economics projects in 4-H had another benefit as well: as early as the 1940s, boys began successfully modeling their self-tailored suits at the dress revues that are a hallmark of 4-H competitions. Women soon extended 4-H to Montana’s Indian reservations. In the 1920s, woman’s club member Jessie Roberts organized the Fort Belknap Clothing Club, the first Indian 4-H club in the United States. Like other 4-H clubs, Indian clubs helped girls develop practical skills such as dressmaking, gardening, canning, and poultry production. Indian club leaders also taught cultural crafts like beading and leatherwork, and girls successfully exhibited their handmade, traditional-style dresses. 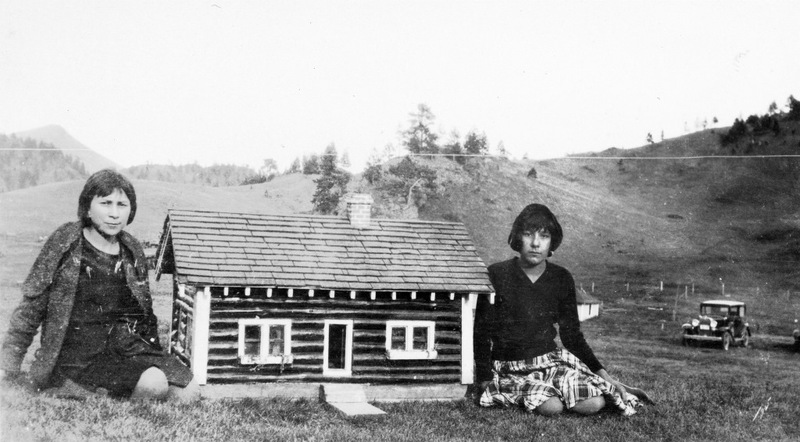 Ruth Grainger, a Lakota club member from Poplar, earned over a thousand dollars during the Great Depression through the sale of her crafts, prepared foods, produce, and poultry. In 1939, Grainger won a trip to the national 4-H camp in Washington, D.C., for her outstanding accomplishments during nine years in 4-H. Along with building young people’s skills, 4-H clubs helped them gain proficiency with emerging technologies. When home electrification spread across Montana in mid-twentieth century, 4-H clubs introduced local communities to new appliances meant to improve women’s household efficiency. When two fourteen-year-old girls from Teton County entered a statewide cake-baking competition in the early 1940s, they used an electric oven for the first time. Nonetheless, their white cake equaled that of older girls who had the advantage of experience. For decades, the vast majority of 4-H girls undertook home economics projects, but a few pursued agricultural projects. At the 1920 Montana State Fair, sisters Eula and Hazel Thompson humbled forty-two boys by winning first and second place in the baby beef category. Gradually, more girls became involved in agricultural production. Montana’s first woman poultry specialist, Harriette Cushman, spearheaded this expansion. Hired by the Extension Service in 1922, Cushman recognized that poultry—generally overlooked by state 4-H leaders in favor of beef, cattle, and sheep—was a mainstay of home economies and an essential source of income for women. Cushman educated 4-H members in egg production, poultry health, quality inspection, and marketing, thus ensuring many successful 4-H projects and enabling Montana youth to attend national poultry industry conferences. This photo of the Norris and Harrison 4-H Girls’ Club was captured sometime around 1951. Photo courtesy MHS #PAc 2008-17.19. One of Montana’s most devoted 4-H leaders, Peace Corps trainer Geraldine Fenn of Bozeman, recognized that Montana’s youth benefited from exposure to new ideas and cultures. Rather than focusing on the 4-H objectives that led to the betterment of one’s own life, Fenn advanced the equally important goals of community development and service. In 1948, she established Montana’s International Farm Youth Exchange (IFYE), a program that sends experienced 4-H youth to countries around the world where they help communities incorporate tried-and-true 4-H agricultural techniques. The IFYE, now part of clubs throughout the United States, has elevated 4-H’s commitment to community well-being to a global level. “Augusta Dillman Evans: First Montana State 4-H Leader.” National 4-H Hall of Fame 2008, Montana. Burrlingame, Merrill G. The Montana Cooperative Extension Service, 1893-1974. Bozeman: Montana State University, 1984. Carter, Betty. Betty Wilson Vimont Carter and Harvey Carter interview, March 20, 1983. Interviewed by Laurie Mercier. Small Town Montana Oral History Project, Oral History 503. Montana Historical Society Research Center, Helena. Cushman, Harriette E. Vertical File. Montana Historical Society Research Center, Helena. “Geraldine G. Fenn – Montana State 4-H Staff.” National 4-H Hall of Fame. Accessed June 3, 2014. Kappel, Tana. “Latvia and Montana Exchange 4-H Ideas.” Montana State University online. MacDonald, Marie. “Country Kids in Chicago: Montana’s First Delegation to the National 4-H Club Congress, 1925.” Montana The Magazine of Western History 32, no. 4, 74-77. McCoy, Betty, ed. Past, Present, Possibilities: Exploring 100 Years of Montana 4-H. Bozeman: Montana State University, 2012. McManus, Irene. Irene Jones Dauwalder McManus interview, March 20, 1984. Interviewed by Laurie Mercier. Small Town Montana Oral History Project, Oral History 776. Montana Historical Society Research Center, Helena. United States Bureau of Indian Affairs. “Sioux Girl from Fort Peck Wins Trip to Washington as 4-H Delegate.” Indians at Work, July 1940, 7(11), 11. Internet Archive.